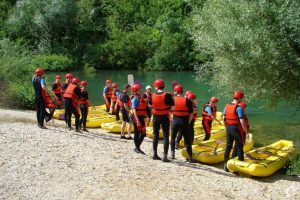 Rafting in protected area of the Cetina river canyon is definitely the most popular and most attended adventure tour in Omis. If you are into adventure and at the same time you want to relax- than rafting, on those second and third grade rapids of amazing canyon of Cetina river, are the best choice for you. 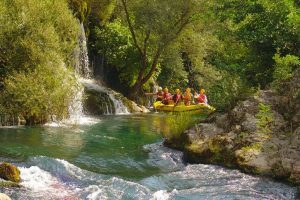 Paddling, swimming, cliff jumping, all of this is part of this adventure in perfectly clean and crystal green water of the Cetina river. The journey begins after we meet at the parking lot or another agreed meeting place. From meeting point you will be picked up by a van or mini bus to the starting point. The ride to start point takes about 20-30 minutes and the whole rafting adventure for approx. 4-5 hours. At start point, your guide will provide you with all the equipment you need. Be sure to bring with you the right outfit and footwear- on hot summer days it means swimming suits, shorts, t-shirts and shoes suitable for water activities. In case of bad weather, you will be provided with neoprene suits. Before starting, you will get more information about rafting and basic training with safety instructions. 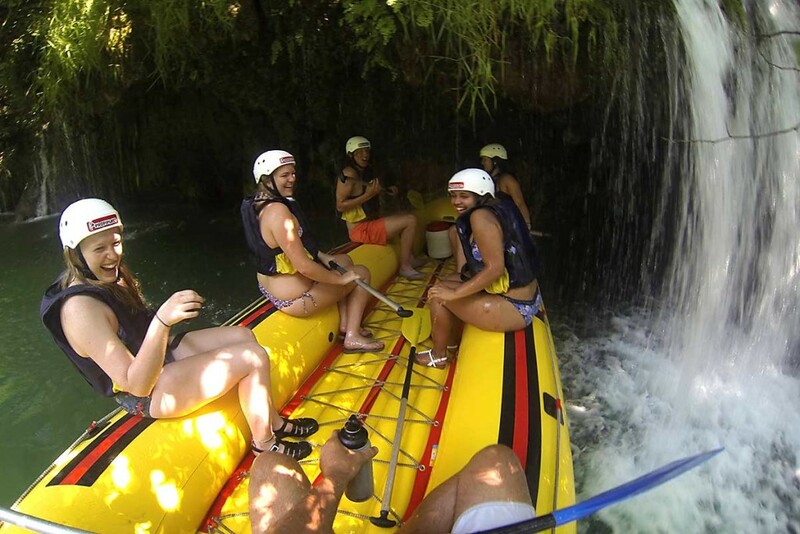 The rafting section is 9 kilometers long and you will be on the river about 3 hours with several stops for swimming, jumping from the rocks into the deep river (optional), sightseeing of the flora and fauna world, showering under the waterfall, drinking water from water spring and possibility of passing through the beautiful water cave. After passing under the waterfall, you enter the first ‘room’ of the cave and swim about 12 meters through fresh spring water. 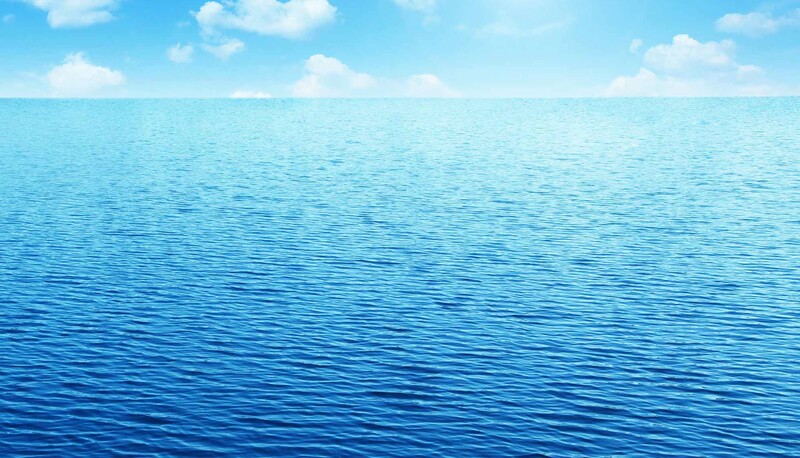 The water is very cold (less than 10 degrees). Then you’ll enter second ‘room’ full of stalactites, stalagmites and small springs of fresh water. 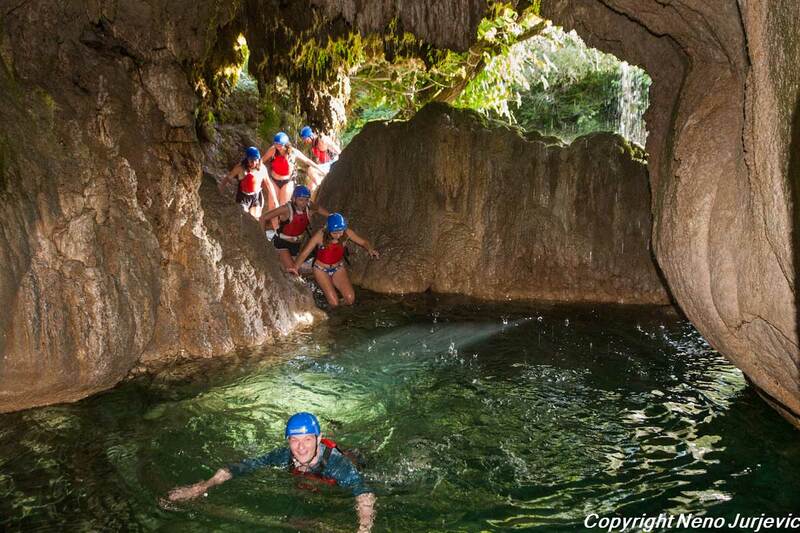 In the middle of the cave there are several smaller lakes fed by small waterfalls with crystal clear drinking water. At the end of the cave there is another waterfall that, like a gentle curtain, covers the exit – an ideal place for taking photos. After the cave comes the second part of the rafting and 5 kilometers more of rowing through beautiful and exciting rapids. In the canyon called ‘Tisne Stine’ you stop for another swim and all guests have the opportunity to engage in jumping from a height of 4,5 to 5,5 meters in water deep for about 6 meters. All these adventures (jumping in the river, passing through the cave, rowing through the rapids, swimming, meeting the animals) will be caught by the photographer. 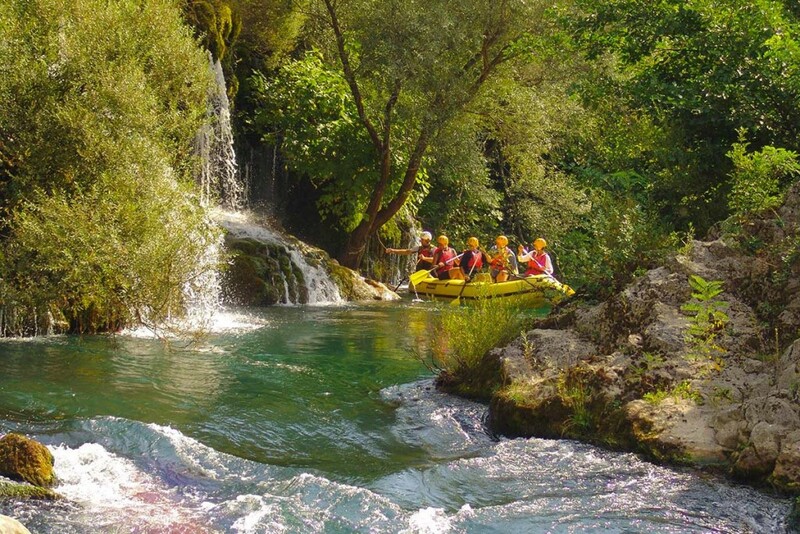 Finally, at the end of the tour, surrounded by untouched beautiful nature along the river, you will have enough time to sit and watch the pictures of your adventure and comment about the excitement of the excursion and toast to your magical adventure on the Cetina river. And do not worry- there is also an alternate route around the cave, you can decide during your trip, which one you want to choose. Jumping is also one more optional thing, so if you are not a jumping fan you will not be tempted to do so. When to go rafting on Cetina? One more good thing is that you can enjoy rafting by sun and rain. Rafting is an excellent option for rainy days because then you are not able to be on the beach or enjoy visiting the cities so it is an excellent option to take advantage of the day. 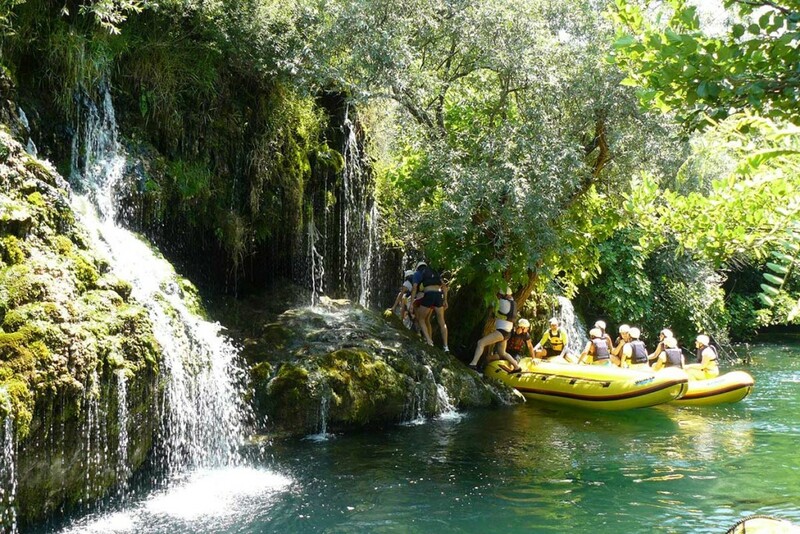 During the rafting you are already wet, so rain does not significantly reduce the atmosphere. In case of extremely bad weather, you can change the time of departure until it calms. On cold days, you are provided with neoprene equipment, footwear and, if necessary, raincoats. We recommend rafting for children from 6 years old, but depending on the adventurous spirit of the children parents and guides can decide together whether this tour is suitable for your child. You don’t have to be able to swim since each participant is obliged to wear a life vest (you get it at the very start). This piece of equipment is designed to keep you on the surface if you find yourself in the river. Just let your guide know that you are a (non) swimmer before the start of the trip. 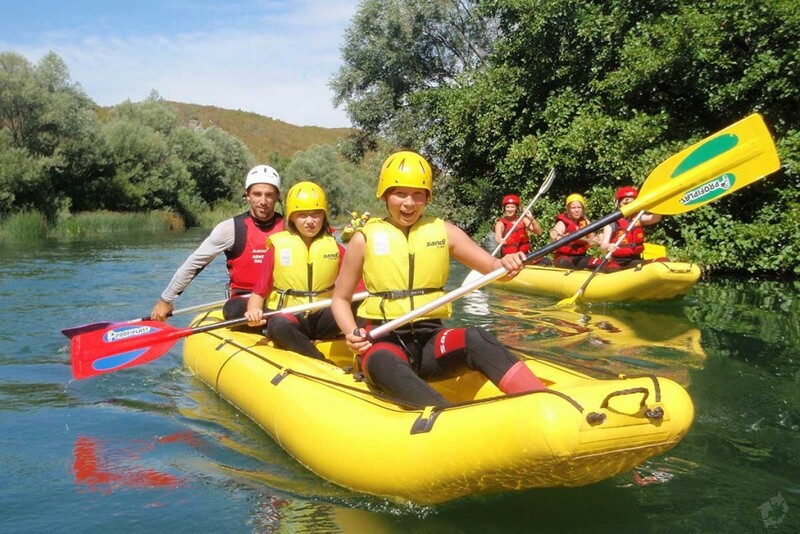 At the start of rafting you will get all the necessary equipment- life jackets, helmets, paddles. Also in case of the bad weather (low temperatures) you’ll have at your disposal neoprene suits, rain jackets and shoes. All you need to bring with you is a swimsuit, a short sleeve t-shirt, a towel and some dry clothes to change after the rafting. During the hot days of summer, you will be asked to keep the shirt under the safety vest. Keep in mind that sitting in the van in wet clothes leaves wet spots on the car seat, so please be sure to change in dry clothes. Also, greasy stains from sunscreen are very difficult to wash off the seat fabric, so please wear short sleeve shirts under the jacket and in the van. 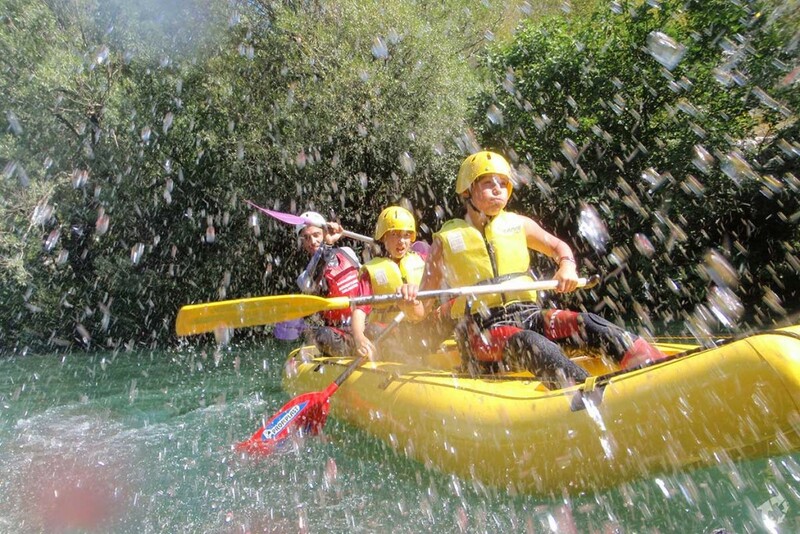 You will get wet during rafting, so it is better to bring devices that are waterproof or not to bring them at all. There is a risk of losing things in rapids and deep parts of the river, so our recommendation is not to carry anything valuable on board, perhaps only GoPro cameras. Although- you’ll be photographed by a professional photographer during the whole trip. At the end, you can see the photos and decide whether you want them (*extra paid). So, let’s resume- the price includes: boat and equipment rental (helmet, paddle, life vest, neoprene clothing and footwear as needed), rafting guide, insurance, free parking, transfer from meeting point to start and back, a drink and a fruit meal. 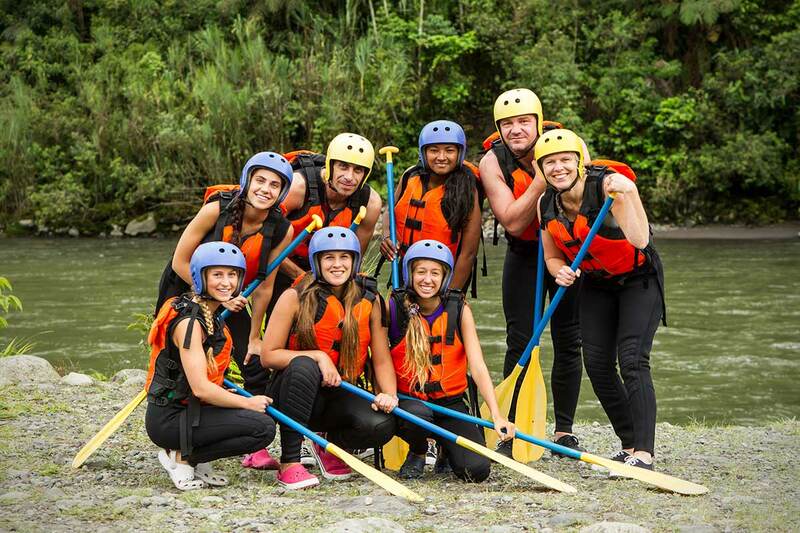 At the very start of rafting, professional guides show the right way to paddle and explain the basics of safe behaviour, providing you with helmet, safety jacket and paddle. 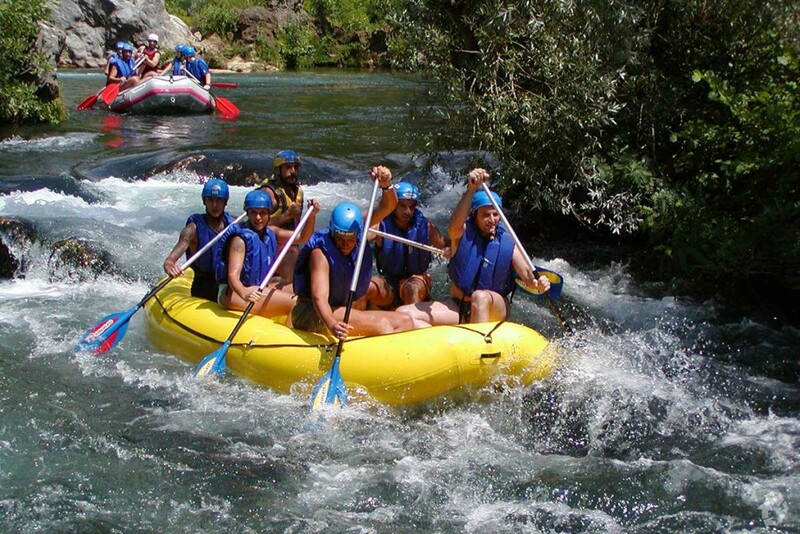 Rafting on this section does not require any previous rafting experience. All you need to bring is- bathing suits or shorts, t-shirts, sneakers or sandals, towels. Desirable additions? 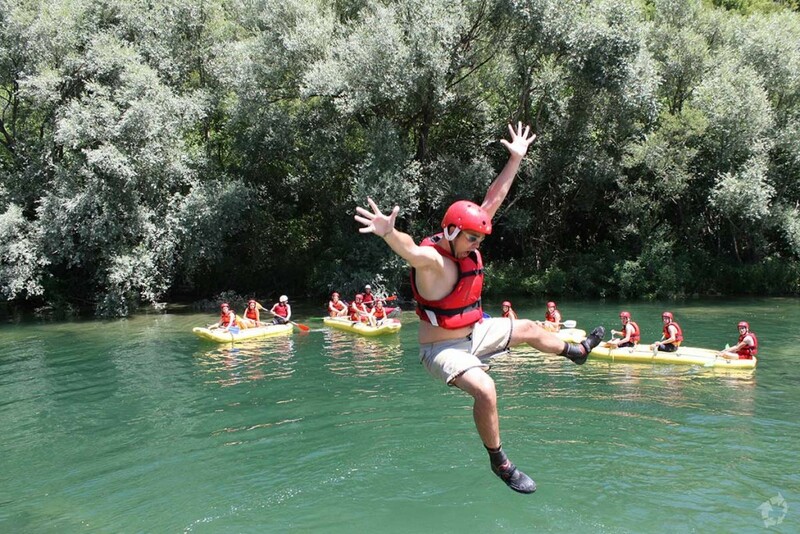 Well, adventurous dose, positive energy, smiling face and you are completely ready for your rafting adventure! Everything else will be handled by amazing crew and their faithful associate- Cetina river!